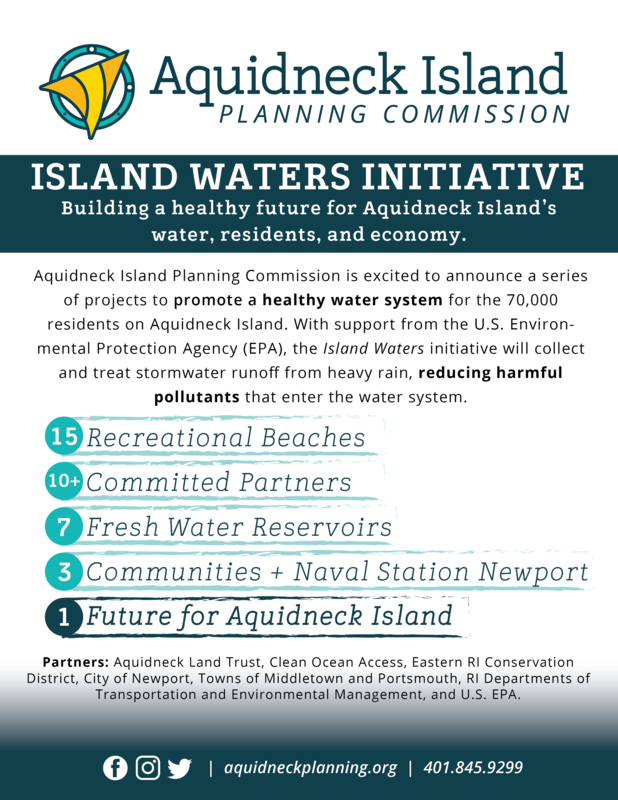 Middletown, RI - During periods of heavy rain, excess stormwater carries toxic pollutants through Aquidneck Island’s drinking water and overflows into recreational coastal waters. 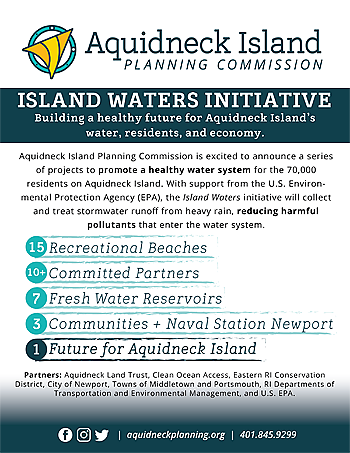 Aquidneck Island Planning Commission (AIPC) has released a set of plans, called the Island Waters project, to collect and treat stormwater runoff, reducing harmful pollutants that enter the water system. Providence — The Reform Caucus, made up of conservative, moderate, and progressive Democrats, announced their push for changes in the House Rules for a more open and transparent legislative process. The Reform Caucus is committed to changing the way business is conducted and after years of careful observation and first-hand experience, we are working to make it happen. 1. Suspension of Rules for the final days of session hinders the public and legislators ability to read bills, process changes, and make thoughtful decisions. Bills need to come to the floor earlier in the legislative session. Recommendation: Rules may be suspended only by 2/3 majority of vote in the House. 2. Sub A to any bill made public for 48 hours. Legislators need to be thoughtful and deliberative and not rushed into last minute votes to end session. The public and advocates deserve the same time to review and understand what their government is doing. As legislators, we have a duty to ensure there are no unintended consequences. Recommendation: Proposed Substitute Amendments shall be posted online, and made available to the public for 48 hours prior to any vote in committee, or on the floor. 3. Bills submitted will stay alive for the entire two year term. This would provide greater efficiency for the committee process and not force the public to return each year to testify on perennial bills. This would free up time for committees to work more in depth on legislation and have substantive hearings to debate Sub A proposals Recommendation: Every bill introduced during year one of legislative term shall remain before the body for consideration in the second and final year of term. 4. Discharge Petition Whenever a bill has the support of the majority of the representatives (38 or more House Members); the bill clearly has enough support to pass the House and deserves a vote Recommendation: Any prime sponsor of a bill would be allowed to circulate a separate discharge petition. If the sponsor gathered 38 or more signatures on the petition, then the bill would be brought up through the regular committee hearing process. The committee would vote to either recommend that the full house pass or send to the floor without recommendation. The committee would not be able to hold the bill for further study. Then the bill would proceed to the floor for a vote. Importantly, the sponsor of the bill could obtain signatures for the discharge petition in the normal course of business. The petition would not have to “sit on the desk” which is the current rule. The Reform Caucus also recommends passage of ‘Good Government’ bills such as creating an Office of Inspector General, and enacting a Line-Item Veto. The House Rules are adopted in the initial weeks of the legislative session every two years after anelection. Currently, House Rules give broad powers to the Speaker of the House in appointing committee members, committee chairs, controlling the flow of bills and the passage of all legislation in the House Chamber. The Contemporary Theater Company has mounted a deliciously dark, toe-tapping production that careens gleefully from parody to pathos with fine acting, brisk staging, and excellent voices that make the show sparkle. And the plant puppets, wow, those plant puppets are spectacular. Special mention needs to go to Rebecca Magnotta, who both designed and runs the Audrey II puppets, from the table-top potted plant to the human-eating critter at the end. The centerpiece of the show, these are intricately beautiful and flawlessly functional. This is no mean feat when (without too many spoilers) several of the characters end up as, well, plant food. 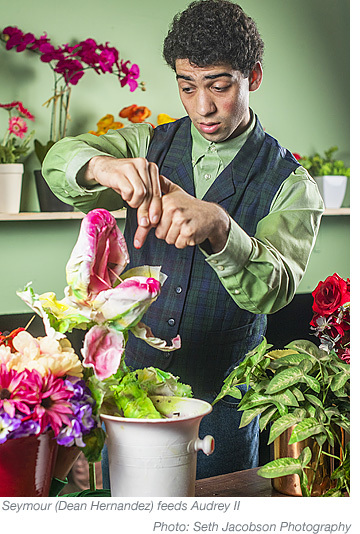 Magnotta's energetic puppetry combines with Jason Quinn's charming, chilling, off-stage voice to bring Audrey II to life. Little Shop of Horrors performances Thurs-Sat evenings Nov 3, 8-10, 15-17 at 7pm, Sunday matinees Nov 11, 18 at 2pm. Tickets ($25/$15 student) available on www.contemporarytheatercompany.com or by calling the box office at 401-218-0282. Sen. Jack Reed, Sheldon Whitehouse, Rep. David Cicilline all spoke, and RI Office of Veterans Affairs Director Kasim Yarn read a proclamation from Gov. Gina Raimondo. State Senators Felag and Seveney, and Reps. Mendonca and Azzinaro were in attendance, as was Town Council member Linda Ujifusa and school committee members Terri Cortvriend and Andrew Kelly. 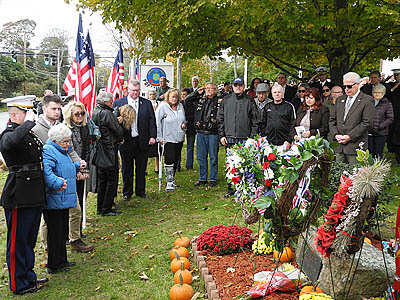 "We come together every year," said Sen. Whitehouse, "To commemorate these lives and the tradition of service that these nine Rhode Islanders and the United States Marine Corps represent." The morning's main speaker, USMC Lt. Col. Jonathan Kenney, delivered an impassioned remembrance that drew on poetry, his time serving in the same battalion, and the memorial to the fallen at Camp Lejeune. "When I was stationed in Camp Lejeune North Carolina," said Kenney, "Every day I drove along Highway 24 to and from work. And I would pass the Bradford Pear trees that line the median of the Freedom Highway. And each of those trees were planted to represent every life that was taken on the 23rd of October. As I pass each one of those trees, it's hard, not to see in every one of those, the extent of loss that was suffered on that fateful day. Every tree represented a Marine with a family. With a mother. With a father. With a girlfriend, with a fiancee, with a wife, brothers sisters. They each had different ambitions. Each of those Marines. 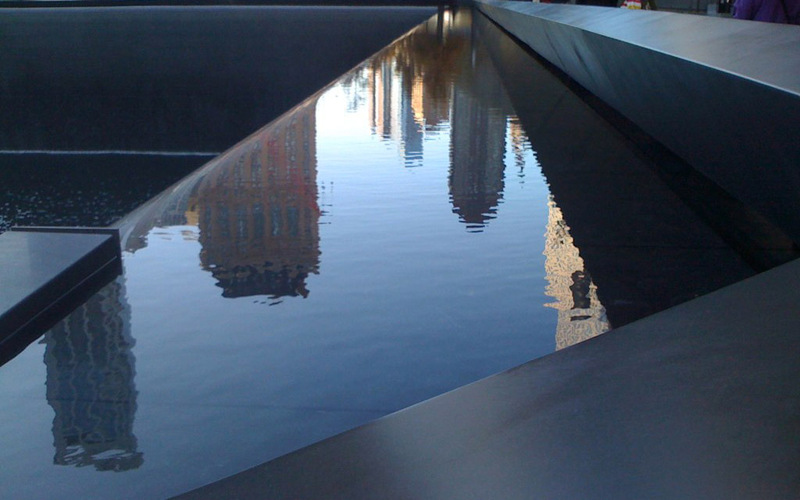 But they served with a common purpose and tragically, we lost them in the blink of an eye." This week's candidate forum at Portsmouth Town Hall saw three people running for the Town Council question the reality of climate change. Their comments came at an event organized by the Portsmouth Concerned Citizens (PCC). But a look back to 2016 shows that they are not the only ones. According to the RI Corporations database, the purpose of the PCC is "TO PROVIDE A COMMUNITY ASSOCIATION THROUGH WHICH MEMBER-CITIZENS CAN ACT COLLECTIVELY TO PROMOTE THE COMMON GOOD AND SOCIAL WELFARE OF THE TOWN OF PORTSMOUTH." Anyone who has read the most recent report from the Intergovernmental Panel on Climate Change might find that mission statement -- and the comments from the other candidates -- hard to square with acting for "the common good" of a town with as much coastline, and as many homes at risk, as Portsmouth has. Second, we can support local, independent news. Here in Rhode Island, we are fortunate to have two robust online news sites, UpriseRI.com and RIFuture.org. (Full disclosure: I write for RI Future.) Here in Portsmouth, we have PortsmouthPress.com. We also have a strong weekly in the Portsmouth Times providing focused local coverage. All of these news organizations could use your clicks, your shares, and, yes, your dollars. Finally, we can and must use our political power to protect our rights. Ask your state reps if they supported Net Neutrality, something which is critical to keep the voices of small news organizations flowing. Look at the records of all your elected officials and judge for yourself whether they support freedom of the press, and when it comes to Election Day, use your power in the voting booth.